Hundreds of thousands of refugees have arrived in Germany. German society is now tasked with helping the new arrivals to integrate. Five projects demonstrate just how this can work. The common room on the fifth floor was furnished by the refugees themselves. Laid out with rugs and cushions, it has become the "Oriental Tearoom", and a link to abandoned homelands. The words "love" and "trust" are on the wall – in Arabic letters. A leafy roof terrace can be seen through a glass wall. From here, the refugees get a view of the centre of their new life: Berlin. Or to be more precise: Neukölln. "At first I thought that this is only a place to stay", says Ibrahim Agha Eyad, "but it's a completely new lifestyle." A 29-year-old from Syria, who came to Germany two years ago, he was one of the first tenants of the Sharehaus Refugio, which has been operated in Neukölln by the Berlin City Mission since the middle of 2015. Almost 40 people live in the building, of which 60 percent are currently refugees. Anyone who moves in here has to be willing to "live in a community and contribute to the community", says Elke Naters. The 53-year-old runs the Sharehaus Refugio together with her husband Sven Lager. After weeks and months in transit accommodation with shared bathrooms, many refugees long for their own place to stay with a little privacy. This is what they get in the Sharehaus. It's also easy to make contacts here, says Eyad. Along with 13 other projects in Germany, the Sharehaus received an eight-month stipend from KfW Stiftung and Social Impact, a social entrepreneurship agency, in the form of an extensive training programme. The Sharehaus also received a Special Jury Prize, endowed with EUR 10,000. The programme is called Ankommer. Perspektive Deutschland and is organised under the patronage of the Federal Minister for Economic Affairs and Energy. The aim is to encourage the establishment of socially-oriented companies that can act as role models for the economic integration of refugees. Integrating refugees is best achieved at local level. The "Ankommer" programme also promotes local projects with the objective of turning them into examples to be followed elsewhere in Germany. The Oriental Tearoom at the Sharehaus Refugio was furnished by the tenants themselves. Elke Naters (centre), who runs the Sharehaus, has already developed similar places in South Africa and in other locations in Berlin. The Sharehaus provides a home for people like Eyad, a computer scientist specialised in business applications, who is beginning a master's degree at the Technical University of Berlin. Or Ajmal Ibrahimi, 21, from Afghanistan, who learnt German in the Sharehaus, helps out as an interpreter at an emergency shelter, and on Sundays plays football as a defender at Sportfreunde Berlin 06. Or Mohammad Al Ghamian, 34, from Damascus. A former UN employee, he set up catering firm "Levante Gourmet" together with his wife, a radio presenter, and six other companions. They specialise in Syrian foods. For refugees in particular, the Sharehaus is a market of opportunities. The "heart" of the project, says Naters, is the public café on the ground floor that is run by the residents and volunteers. German and yoga classes take place in the adjacent room. Kiron University, an online education institution, holds seminars here, while every few weeks the refugees put on a party with food and dance. Some of the rooms in the large building are rented out to initiatives that also focus on refugees. According to Naters, Sharehaus Refugio is designed to support itself through rental revenues and income from the café. For Eyad, Ibrahimi and Al Ghamian, their time in the Sharehaus will finish at the end of the year. Refugees can stay here for up to 18 months, then they give their place to someone else. Naters and Lager have already developed similar places in South Africa and elsewhere in Berlin. "The concept of mixed living and working is a successful solution for the quick integration of refugees", says Naters. The proportion of non-Germans living in Neukölln is well over 20 percent. In Neubrandenburg, a two-hour train ride north of the capital city, this figure is just four percent, and rising slowly. The arrival of refugees in the lowlands of Mecklenburg-Vorpommern could be welcomed for the simple reason that migration to the cities has really left its mark there. Working together on the dokART project: Heleen Gerritsen, Issam Barhmjy, Mazen Ismaiel and Mohamad Anas (from l to r). Since 1990, the population of Neubrandenburg, for example, has shrunk by almost a third to 64,000. But attempts are being made to reverse the trend. "The town has recognised its opportunity", said Heleen Gerritsen, referring to the Migration network established by the municipality, which comprises 15 associations, organisations, authorities and church communities that take care of more than 2,000 refugees. The 37-year-old Dutch citizen is responsible for one of the few "Ankommer" (new arrivals) projects that is not based in a large city. It is called dokART, based on dokumentART, the international documentary film festival that Gerritsen has managed since 2014. Through constant cultural exchange with foreign filmmakers "we are almost predestined" for a refugee project, said Holm-Henning Freier, managing director of the Latücht Film & Medien association that has organised the festival since 1992. Since 1 April, eleven refugees have completed a traineeship at the association's media workshop, which is located in the building of the community college and has cinematographic equipment. The trainees are taught camera and sound techniques as well as attending classes on film history. Alongside the creative aspects, the programme also includes office work, understanding and editing standard contracts, preparing accounting documents, producing cost calculations as well as updating websites. Heleen Gerritsen explains techniques to Ahmad Alhamwi Alhafez. Mazen Ismaiel handles the sound. The idea of working together with refugees came about last year. As ever, the film festival team was looking for English-speaking trainees to help with organising the five-day festival. This time, a Syrian refugee living in Neubrandenburg applied. He brought some friends, so in the end two dozen refugees worked in the accreditation office and at the ticket office for the 24th dokumentART event, welcoming guests and organising the Latücht community cinema for the days of the festival. This was the refugees' first step towards working in Germany and an opportunity to prove their skills. "The association is an ideal place for meeting people", says Gerritsen. Other organisations may advise refugees, but: "Here, we like to focus on cultural entertainment, too." For example, the trainees are helping to choose films for the "Exodus and Arrival" series, and will be picking entries for the separate part of the festival entitled "Europe Expanded". During the traineeship, the new arrivals learn their first film craftsmanship skills and shoot their own videos. The refugees can also receive training in events technology and media design; the media workshop can offer two apprenticeships. But, as Gerritsen says, "you need good German language proficiency for this". At "Ankommer" project CodeDoor, by contrast, it is rather English that helps. Liban Hassan, 27, obliged. 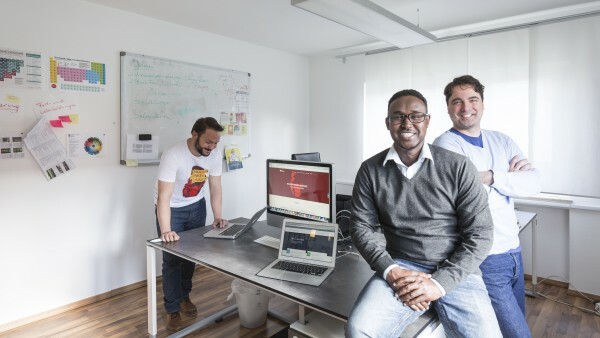 A refugee from Somalia, last year he learned a programming language under the tutelage of Karan Dehghani, one of the founders of the Gießen-based CodeDoor organisation. Hassan was the first person to take part in the CodeDoor project. The name says it all: it essentially means "programming opens doors". Hassan is currently completing a traineeship at the Federal Employment Agency in Gießen. He is also attending a language school to improve his German. Hassan also wants to take the programming course at Udacity online university from Silicon Valley, which lasts several months and is key to the work of CodeDoor. Students completing it receive a mini qualification, a so-called nano-degree, and the ability to programme apps and build websites. Alongside the stipend, the CodeDoor project was endowed with start-up funds of EUR 20,000. "Udacity liked the fact we didn't ask for money, but training." 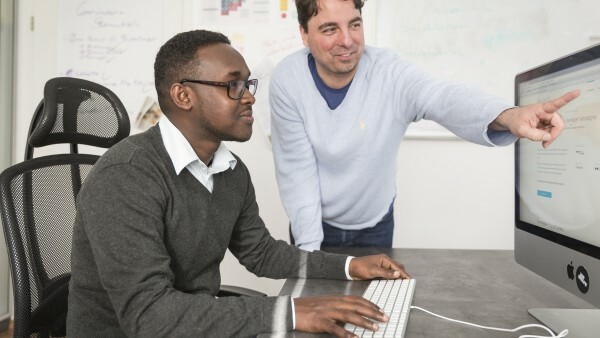 Liban Hassan (front) at his traineeship at Swiss Commerce. CodeDoor co-founder Karan Dehghani (right) supports the young programmer from Somalia. Normally, the programming course costs USD 200 per month. Udacity, co-founded by former Stanford Professor and Google developer Sebastian Thrun, provides CodeDoor with the teaching materials for refugees free of charge. How did that come about? Dehghani presented the CodeDoor idea to the Udacity founders in an email. He received a positive response in just two days. "Udacity liked the fact we didn't ask for money, but training." Dehghani predicts good job opportunities for CodeDoor graduates. "Programmers are in high demand", he says, "we have good contacts with start-ups and our programmes are very practical." CodeDoor now offers courses in Frankfurt and Berlin. A total of 25 volunteer tutors regularly help the refugees with their studies; around 150 will have their nano-degrees by the end of the year, estimates Dehghani. The requirements laid down for "Ankommer" projects are high. From those who receive a stipend, KfW Stiftung and Social Impact require a concept on how their model can become self-sufficient, how it can become a social enterprise. This is because KfW Stiftung and Social Impact are convinced that new social enterprises play "an important role in solving current social challenges using economic means". Karan Dehghani provides support and predicts good job opportunities for the graduates. Programmers are in demand. Dehghani, who developed an online gift website shortly after finishing school and sold the virtual shop to a retail group, today works full-time for a start-up investor. He fits the profile of a "social entrepreneur". His revenue model for CodeDoor is as follows: every company that employs one of the trained programmers makes a donation of at least EUR 500 to the project. And after completing their training, every refugee works ten hours a month pro bono for CodeDoor over a period of twelve months. The calculated revenue stream should suffice to ensure the project is professionally managed. So far, everyone still works on a voluntary basis. "Sustained value creation": this is how German/Iranian Dehghani describes the goal of the CodeDoor project, which first and foremost wants to give people a job. But value is created in a social sense, too: "We give people hope." Now aged 40, he comes "from the world of the Internet and start-ups" as he says. This connects him with Lars Maertins, 25, from Heidelberg. A physics student, he swears by mentoring in training: young people struggling with school – for whatever reason – are supported by a mentor. Maertins followed this mentoring principle with the successful "Rock Your Life!" programme for secondary school students; he headed up the programme's Heidelberg Association from 2013 to 2015. "I wanted to give disadvantaged people better opportunities in making the transition into the labour market, and it is currently refugees that need this the most", he said, justifying his move from Rock Your Life! to his own project known as "Chancen gestalten" ("Shaping Opportunities"), which launched in February 2015. "Currently it is refugees that need the programme most." Lars Maertins, founder of "Chancen gestalten"
Lars Maertins wants to set up "Chancen gestalten" in several cities in the coming years. His project does not need any permanent premises – as yet. The mentors meet their mentees once a week in various locations. The mentees are refugees who attend the Johannes-Gutenberg Vocational School in Heidelberg. The programme is rounded off with joint activities like walks, city tours and cooking. The aim is for the mentees to obtain their school-leaving certificate or complete their vocational training course. German is spoken during the mentoring process, "which is certainly difficult", says Maertins, "but this is the best way to support our mentees". 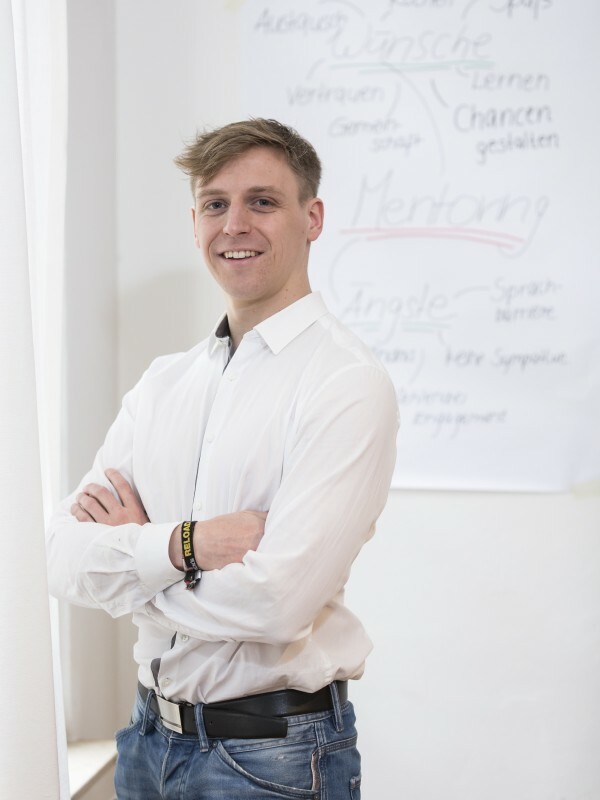 He has a fairly specific idea of how his social enterprise should look, and already during his own studies he set up the gUG (a non-profit entrepreneurial company), which is an umbrella organisation for the local associations. This gUG advises the associations and is also responsible for training the mentors and mentoring coordinators. In turn, the associations pay contributions to the head office and obtain funds for their mentoring programme from local sponsors, trusts and municipal bodies. More than 200 refugees have now taken part in the "Chancen gestalten" mentoring programme in Heidelberg, Passau and Osnabrück. The system is currently being set up in Munich, with another to follow in the region of Essen. Maertins believes that the mentoring market is currently very competitive. A great many programmes are on offer. As proof of the quality provided by Chancen gestalten, he refers to the "very low dropout rate". It is not a problem finding a sufficient number of mentors. The mentoring programme, which has seen almost 80 refugees take part in Heidelberg since it was established, already has an offshoot in Passau. This branch focuses exclusively on refugees who want to complete an apprenticeship. He used to mentor himself too, but now has no time for this. "I am building a company", he says, and knows that this is the best way he can help. In just a few months, "Stitch by Stitch" developed into a genuine business. This is how the company works today (KfW Group/n-tv). This video is only available in German. Claudia Frick and Nicole von Alvensleben from Frankfurt have one thing over social entrepreneur in-the-making Lars Maertins: they know all about self-employment, as they have been their own bosses for a long time. Frick, 43, is a fashion designer and master tailor, and set up her own fashion label Coco Lores seven years ago. Von Alvensleben, 47, is a designer and advertiser, and brings her marketing and design expertise to their joint "Ankommer" project Stitch by Stitch, which focuses on making textile products. "We give refugees the chance to bring their waiting to an end." Syrian Esra Ali (r.) also likes to look around the studio of Claudia Frick, co-founder of Stitch by Stitch. Frick's studio is found in a rear courtyard in Frankfurt's Nordend district. Here, between rolls of fabric, thread spools and sewing machines, she designs the Coco-Lores collection. And this is where Esra Ali occasionally looks over her shoulder, a 20-year-old Syrian, who came to Germany a year ago with her parents and siblings. "I want to design something myself one day", says the young woman, who had begun studying fashion design in Syria. She is now the first female refugee to help out at Stitch by Stitch. She sews using the machine and by hand – and "stitches very well", says Frick. Esra Ali attends school in the mornings, and was hired for the project after completing her integration training. With their "Ankommer" project, Frick and von Alvensleben want to combine the solutions to two problems. "We give refugees the chance to bring their waiting to an end", says Frick. And they are helping to remedy the lack of tailors in Germany. Workshops that process designs for small-scale series are rare. Coco Lores shares this problem with other small labels. This is why the first orders for T-shirts or bags arrived not long after word about the launch of Stitch by Stitch got about. "Hand-made products are in demand again", said von Alvensleben. And in the truest sense of the word, Frick is also expecting to see a material enhancement of their activity. Tailoring follows the same working methods around the globe, but regional characteristics do emerge. Designer Frick is delighted with the seamstresses who command techniques "that we no longer use or know", and lend their expertise to the project. But sewing is not reserved exclusively for women. Men have also applied for the "Ankommer" project, and there are even more inquiries from male rather than female refugees, reveal the founders. But for the time being, Stitch by Stitch will remain a female project. This article was published in the spring/summer 2016 issue of CHANCEN on the subject of migration. It was updated in June 2017. Textile companies mostly produce their products in developing countries because of the low-wage workforce available. Yet von Alvensleben knows that customers look out for "Made in Germany" labels. Products that leave the Stitch by Stitch workshop are not only "Made in Germany", they are also "Made by Refugees". Alongside the stipend, Stitch by Stitch received start-up funding of EUR 20,000 from an external jury. Thanks to the high standard of projects from 2015, KfW Stiftung and Social Impact gGmbH continued their stipend programme with 15 new start-up teams. The stipend has a term of up to eight months and includes services worth EUR 12,500. 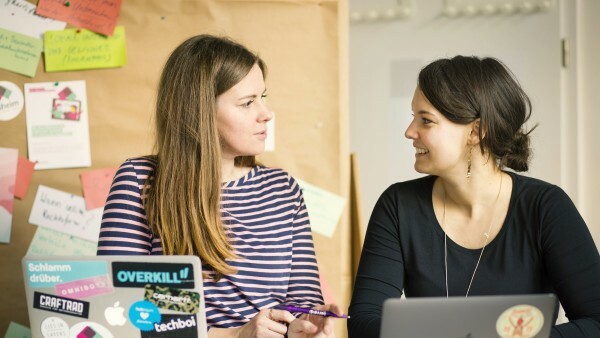 These include coaching, specialist consulting, workshops and coworking space in the 80 labs of Social Impact gGmbH, located among other places in Berlin, Frankfurt, Hamburg, Leipzig and Duisburg. After the stipend there is the chance to take part in a tandem programme: partners from the business world and the third sector improve the solutions with the stipend holders so the project can be implemented in practice. There is also the chance to win EUR 20,000 in start-up funding from the new Special Impact Award. In the categories of "Ankommer", “AndersGründer” and “Community Award”, KfW Stiftung and Social Impact gGmbH recognise sustainable business models from the Social Impact labs in Frankfurt and Duisburg, designed to solve social problems. These incubators are supported by KfW Stiftung. Total start-up funding of EUR 45,000 is awarded. The "Special Impact Award" of KfW Stiftung and Social Impact gGmbH was presented in Frankfurt on 6 June 2017. As part of the "ANKOMMER. Perspektive Deutschland" and "AndersGründer" promotional programmes, the award (which was awarded for the first time in 2017) recognises start-up business models that aim to solve social and societal problems using business means – on a sustainable and scalable basis. In the " ANKOMMER. Perspektive Deutschland" category the "Special Impact Award" of EUR 20,000 for the development of innovative and (social) entrepreneurship concepts to provide displaced people with better access to education, training and jobs in Germany, went to the Willkommen in der Pflege (Welcome to the Care Sector) team. Anchored within the "Bonner Verein für Pflege- und Gesundheitsberufe e. V.", this programme offers comprehensive orientation services enabling a low-threshold entry into domestic housekeeping, care, and nursing, focusing on elderly care. In the " AndersGründer" category, the start-up funding of EUR 20,000 for solving a social problem and transforming the idea into a sustainable business went to the Companion2go team. The team from Marburg have developed a low-threshold platform that brings together people with and without disabilities so that they can attend events and travel together. In the " Community Award" category chosen by the online community of both the "AndersGrü̈nder" and "ANKOMMER. Perspektive Deutschland" programmes, the EUR 5,000 award went to Bemela Coffee. The team from Frankfurt am Main are building a company selling fair-trade coffee, whilst also giving displaced people the chance to embark on a career as a barista in their special coffee training centre. Germany is in the process of deciding whether hundreds of thousands of refugees will have the chance to feel at home in their new country or be made to feel permanently alien. A discussion about qualifications, special provisions in school and at work – and the German constitution. Video telephone platform "Daheim" (“Home“) enables refugees in particular to learn German in a virtual environment. 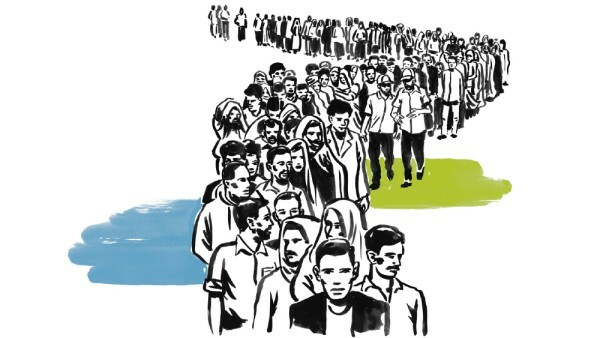 A profile of the start-up and its contribution to social participation among refugees. War, persecution and a lack of economic opportunities lead many people to flee to Europe. New border fences can do nothing to change that. The causes of migrations have to be addressed. But how? Five experts offer their insights in this exclusive KfW Stories article.